Badle Ki Aag is insane. There are SEVEN children in peril as the film opens, from three different families. 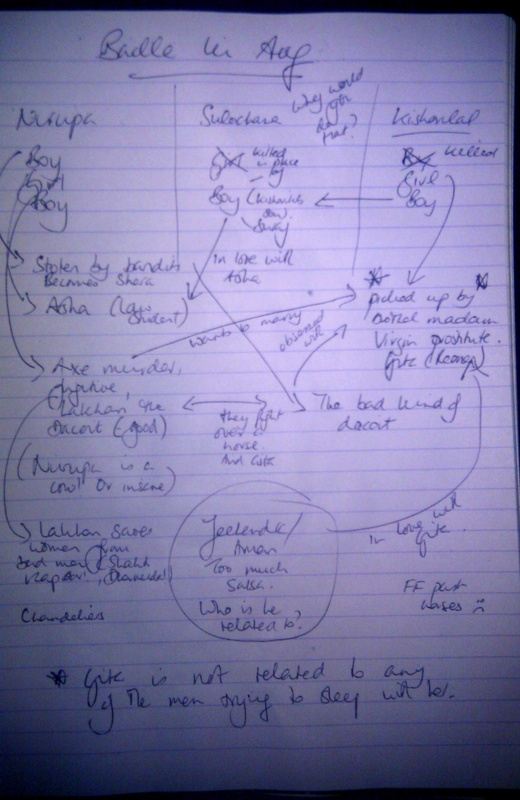 I had to make notes to work out who was who. Normally I might not care so much but as one of the kids grows up to be the object of love or lust for several of the others, I felt I needed to be clear on who was related to who just to stop my shrieking ‘No! What? She’s your SISTER…oh um … hang on …OK”. So just in case you find yourself in that same position, please feel free to use this cheat sheet. Extra points if you can read it! So much happens in the first twenty minutes that I expected the rest of the film to fizzle out, but it is packed with incident, conflict, coincidence, horrible outfits and so much melodrama I almost passed out from the effort of keeping up. I really like all the people standing around in the background – are they interested onlookers or disgruntled commuters? 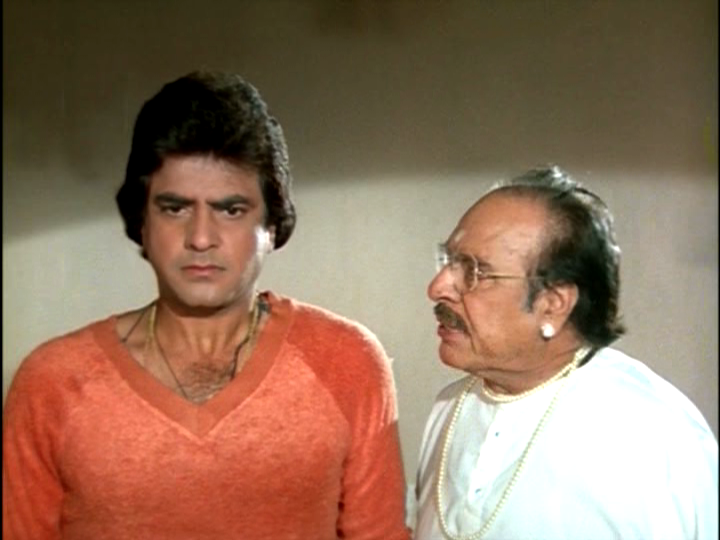 Dharmendra looked bleary and puffy for most of the film, and Jeetendra looked a little the worse for wear too. 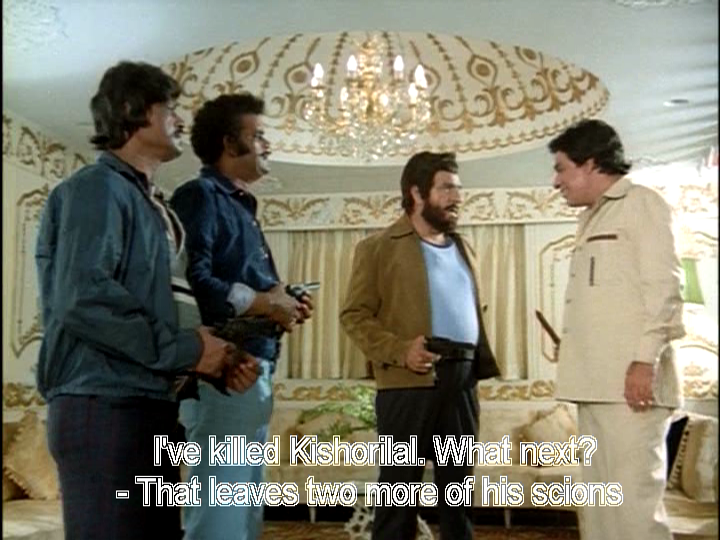 Anyway, I wondered if he and Jeetendra might have been enjoying a glass or two or ten of an evening. 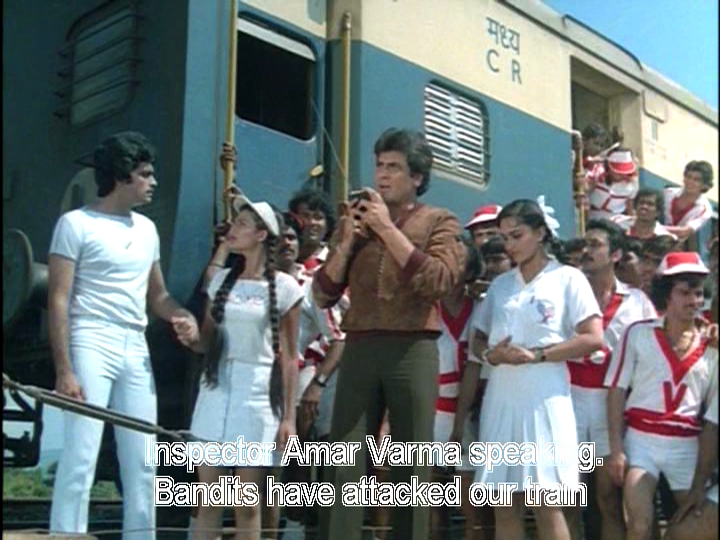 I’m not a big fan of Dharmendra and he is certainly overshadowed here by Reena Roy, Smita Patil and Sunil Dutt. Shera is a horrible character with no redeeming features, and I really pitied anyone who had to put up with his mood swings. 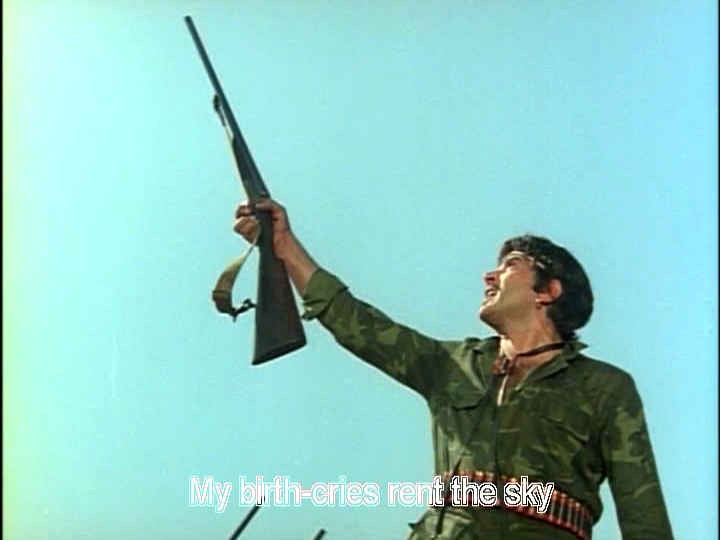 Sunil Dutt plays Lakhan in swashbuckling style and seems to have decided that since almost everyone else in the film is stupid, he will talk directly to the camera. He declaims some hilariously over the top dialogues with his typical conviction and manages to make it seem almost sensible at times. He is the honourable dacoit, protecting women and doing god’s work as he evades the law. Of course he did start his career in crime by killing a man who was assaulting his Ma. He is competent and resourceful – good in a fist fight and able to rig up a jeep as wrecking ball for a spectacular jailbreak. 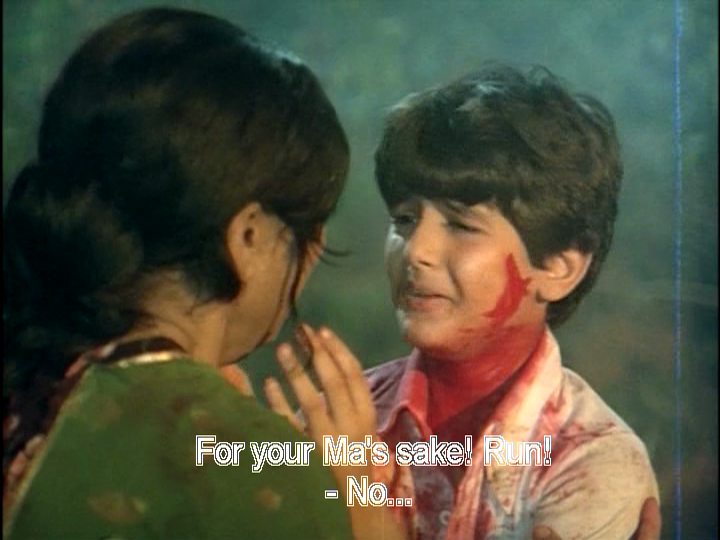 Nirupa Roy is the worst mother ever. If she isn’t just plain losing her children she is warping their delicate minds with psychological torment. 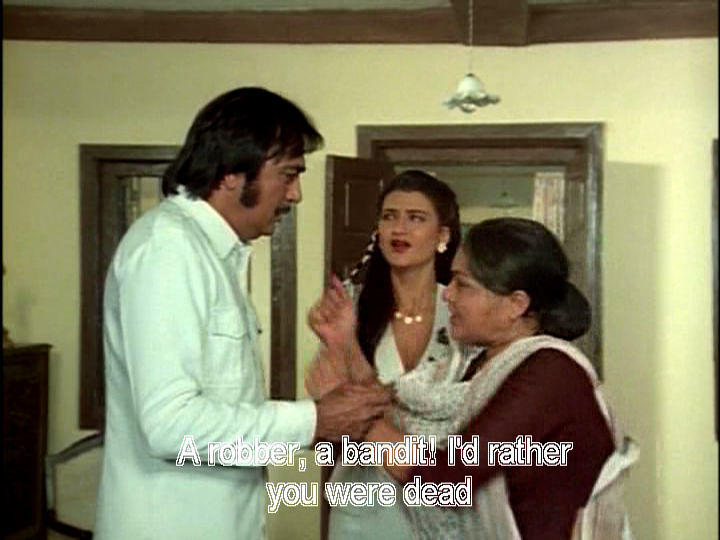 One minute Lakhan is her golden child and favourite tiny axe murderer, next he is being berated for his crimes. Sheesh. 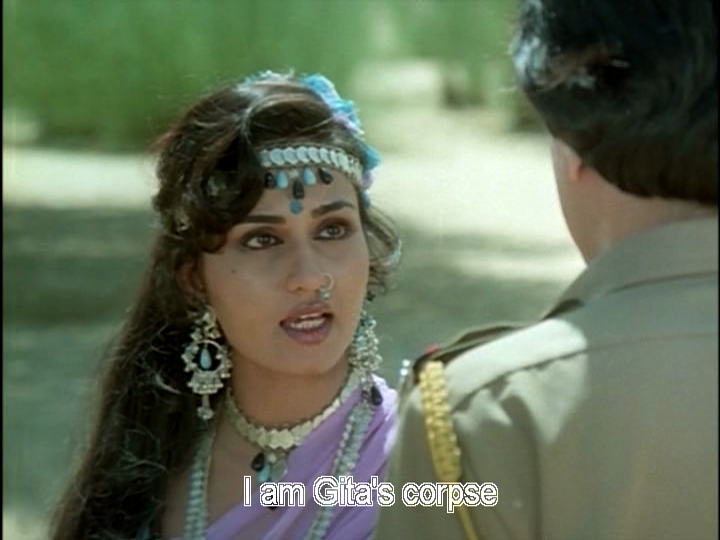 Reena Roy is wonderful as Gita. 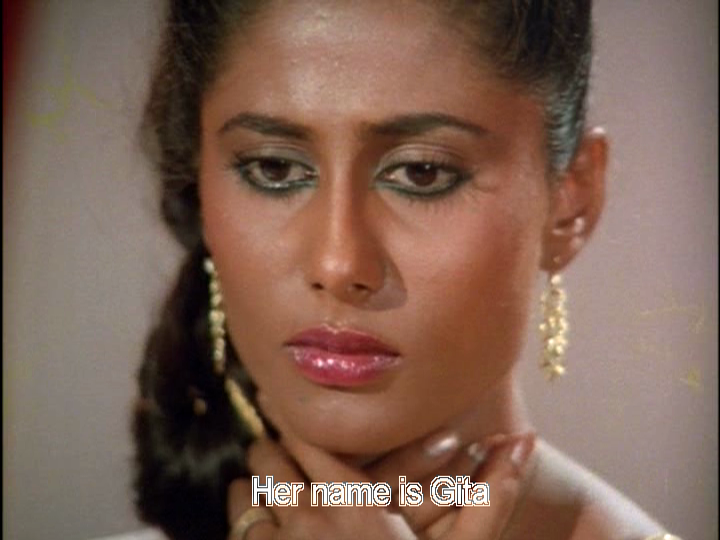 Gita was adopted by a lady who seems to run a small scale brothel – and Gita only ‘dances’ so she is a virgin prostitute. Amar falls for Gita and she loves him too, but love cannot get in the way of her revenge mission. When she realises that Lakhan might put her closer to her goal she decides he might be the best prospect. Love is less compelling than killing Rajaram. Given that her profession closes many doors to family and relationships, Gita is quite self reliant and philosophical, and doesn’t waste too much time on self pity. She doesn’t wait for the menfolk to sort out her revenge, she goes for it herself. I really enjoyed Reena Roy’s performance and she has some amazing outfits. 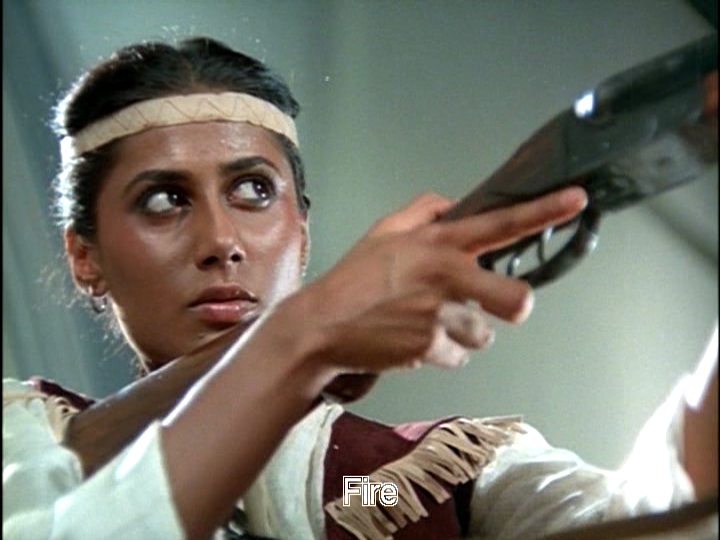 Smita Patil doesn’t seem entirely comfortable in this madness but seems to be so determined to deliver a quality performance regardless of the material. I felt really bad for Bijli. She had to wear fringed Annie Oakley outfits, and was hopelessly in love with Shera. What a thankless life. When she got him drunk and had her way with him, his reaction was quite insulting. I thought he might be more circumspect considering she was a professional knife-thrower. Poor Bijli. She doesn’t take rejection as the final nail in the coffin, and continues to fight for ‘her’ man. Badle ki Aag does some things so well and others so very badly. When Gita is half drowned, Lakhan saves her but does not resort to the Shashi Kapoor school of hypothermia cure. He is a sensible man who uses a blanket to cover her body and keeps his own kit on. He is also a filmi hero so he knows that now he has touched her, he must marry her lest they both lose honour. On the downside some stunts are so ill conceived and poorly executed that they went beyond funny and into ouch territory. Especially for the horses. I liked the blatant use of plastic horses in some scenes, but then they used real ones and it looked horrific. 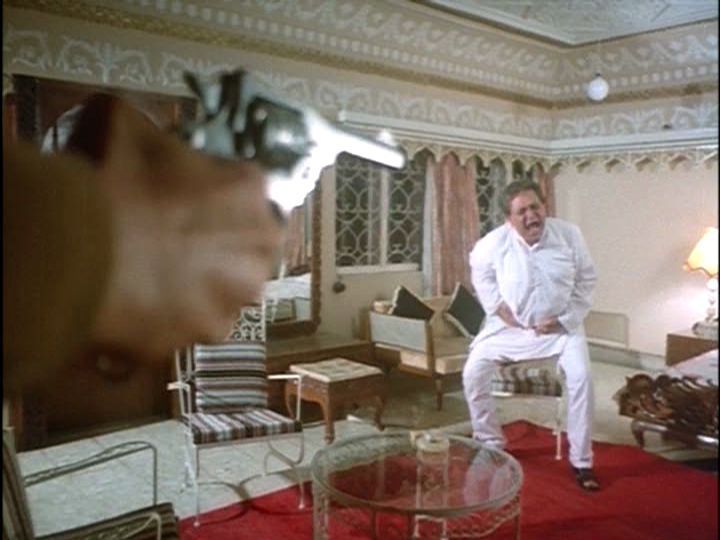 Kader Khan is double the fun as the arch villain and his twin brother, and lots of well loved character actors turn up in uncredited supporting roles. 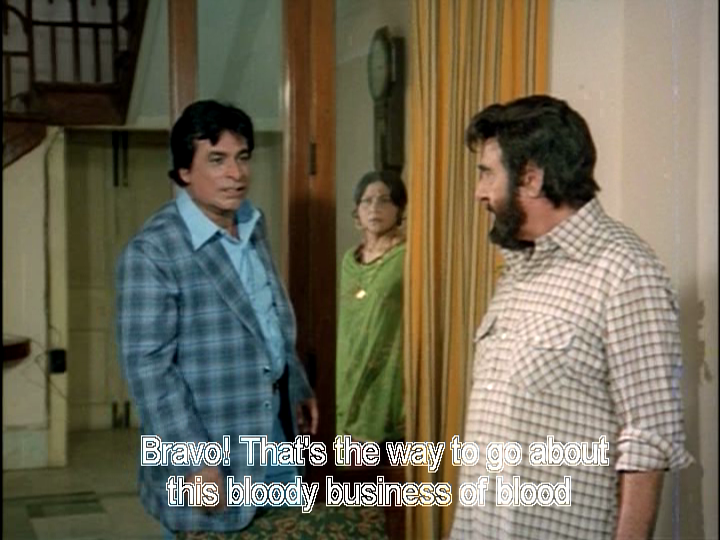 Pran is a police officer, Om Prakash is a dithering fool with good intentions, Sulochana Latkar is a nanny and load of others from Madan Puri to Jankidas to Shakti Kapoor do their thing. Sarika was OK in her small role as Lakhan’s sister. Asha is another of the interesting women in the film – a law student who stands up against her boyfriend Suraj’s harsher views on capital punishment. 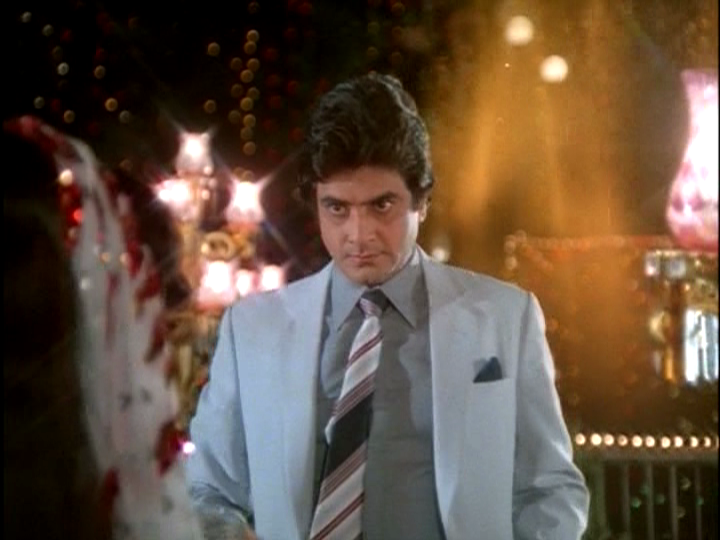 The Laxmikant-Pyarelal songs are a highlight, not just because of the costumes. Reena Roy does lots of dancing, and there is a fun qawwali with all three leading men in flimsy disguises. Most of the dances take place at Rajaram’s palace and the carpet is a sight to behold. 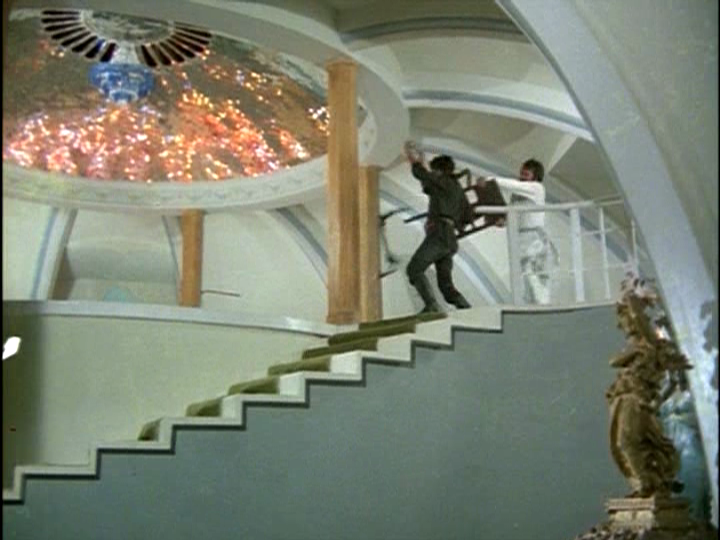 Shera lives in a lair reached through a cave, but one that includes a spacious living area with silver tiled dome and chandeliers. Lakhan’s cave complex is more traditional. Rajaram’s place is a fabulous eyesore. And the costumes are just crazy. 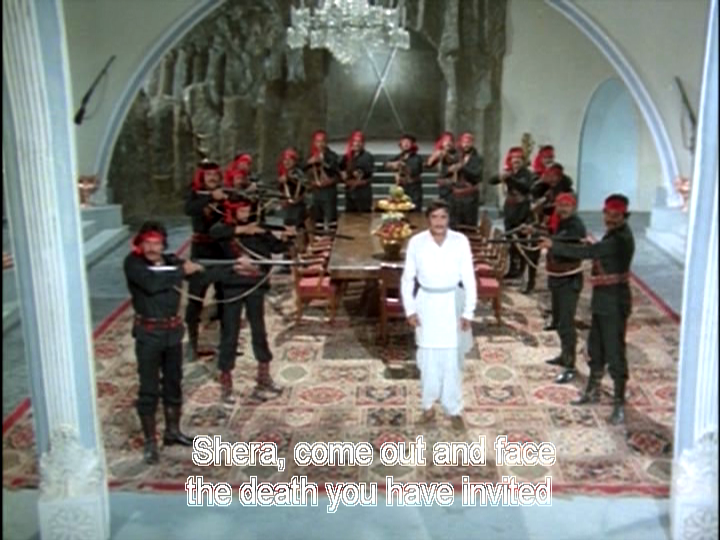 Sunil Dutt and Dharmendra are in basic white (Lakhan) and black (Shera), but everyone else seems to be at the mercy of the some very creative designers. There are crazy camera angles, amazing interiors and colour and movement everywhere you look. Rajkumar Kohli has certainly fulfilled the commandment to be entertaining. 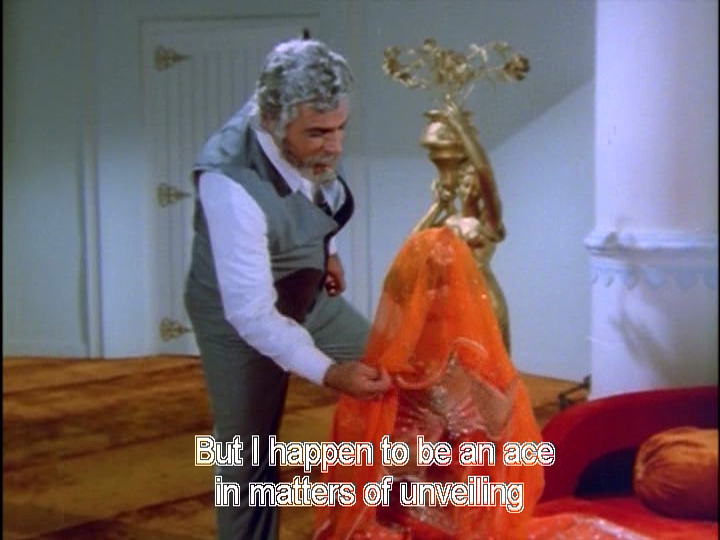 I have a soft spot for Badle ki Aag and its cavalier disregard for facts, logic, physics and colour coordination. I highly recommend it – with a caveat regarding the horses. 5 stars for fun, maybe 3 for quality. Do yourselves a favour and watch it! Heather says: This has to be one of the most OTT masala films I’ve seen, and I was literally reeling (and laughing hysterically) after just the first 20 minutes of mayhem. It’s no wonder that I started to get confused when all the children turned up as adults – thank heavens Temple had already told me that no-one erroneously hooked up with their long-lost sibling! 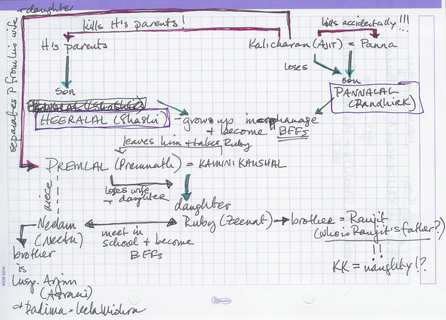 But the beauty of Badle Ki Aag is that it all makes sense eventually and getting to the end is just so much fun. I loved the fake fight scenes, the not-so-special special effects, incredibly awful costumes and fabulous dialogues. ‘I’ll take your eyes for my shirt buttons’ has become my preferred threat and I’m sure ‘Even those who have no feet leave their footprints’ will come in useful at some stage too. Every single utterance appears to be a matter of life or death and there is so much scenery chewing that it’s surprising the sets hold up under the strain. But underneath all that masala-y goodness and after getting through the truckloads of plot, there is more happening than just lost children, murder, revenge and all that velour. There is an underlying commitment to at least some form of justice throughout the film and I liked how people finally had to pay for their crimes, no matter who they were. I also enjoyed the rather novel concept (at least in Bollywood) of a hero who was prepared to stand up and fight for woman’s rights. 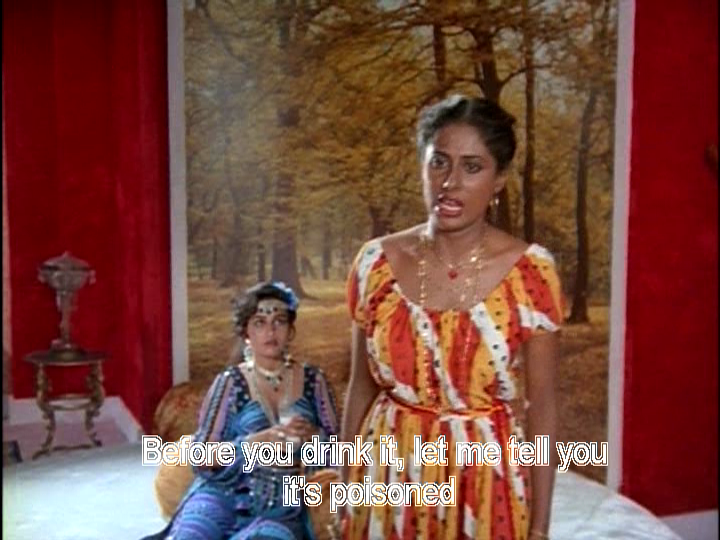 Lakhan’s commitment to respect women makes him a more interesting character even though I’m not a big fan of Sunil Dutt and he didn’t endear himself to me with his performance here. Jeetendra was OK, and I do generally like him in these roles, but I agree with Temple that Dharmendra was particularly irritating as Shera. In comparison the women were excellent! Gita had a practical streak when she debated over which one of her suitors would give her the best chance to gain her revenge and I loved that she was well prepared and methodical in her approach. There had also been some thought put into Asha’s character in the way that she decided to fight injustice against her family in a different way and was studying to be a lawyer. Every female character was more than just a romantic love interest, and I did love Bijli’s knife-throwing as a means of gainful employment. This film really does have almost everything – it’s a who’s who of the actors from the era and there is enough plot for at least 5 films! I’d recommend it for when you really need a dose of masala and don’t want logic or good acting to get in the way. 4 stars purely because it made me laugh so much! 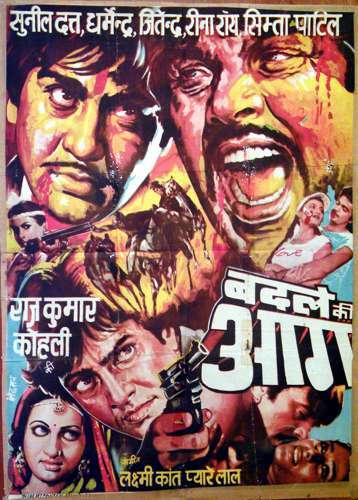 This entry was posted in Bollywood and tagged Badle Ki Aag, Bollywood, Dharmendra, Hindi, Jeetendra, Kader Khan, Laxmikant-Pyarelal, Madan Puri, Nirupa Roy, Om Prakash, Pran, Rajkumar Kohli, Reena Roy, Sarika, Smita Patil, Sulochana Latkar, Sunil Dutt. Bookmark the permalink. I think you will find much to enjoy. Especially all the Nahiin faces! WOW. Just wow. I cannot WAIT to see this. 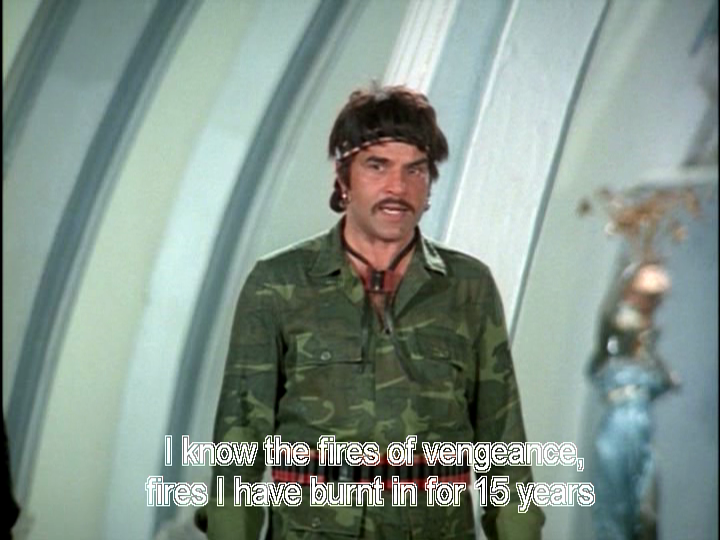 I have had a fairly taxing last few weeks and now I realize that the real problem is not my jobs or friends in distress or horrible weather – it’s that I haven’t seen any 70s masala in AGES. What a revelation! This is one of my all time faves! LOVE IT, it is def one of the maddest films I have ever seen 🙂 Your cheat sheet idea = genius! I had to rewatch the first 20 minutes just to work out who was who so I decided the notes would save me effort and anguish 🙂 What a crazy film – and when you look at the cast and the production team it must have had a huge budget. And yet it is a glorious B (at best) movie! 😀 Maybe we could start a business charting tortuous masala rishtaas!